The Most Venerable Kyabjé Bokar Rinpoché, lineage Master of both the Shangpa and the Karma Kagyü, was born in Tibet, in 1940 (Iron Dragon Year) to a family of nomadic herders. 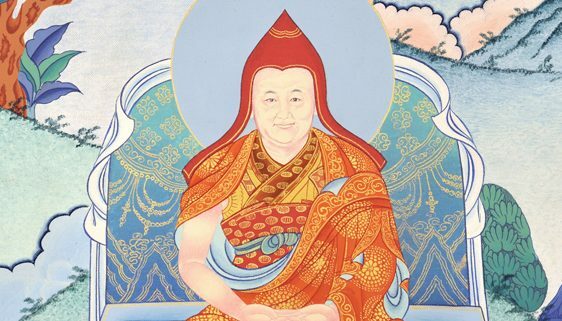 Rinpoche was trained at the monastery founded by his predecessor, Karma Shérab Ösel. He continued his studies at Tsurphu Monastery in Central Tibet, main seat of the Karmapas. While still a teenager, he assumed full responsibilities for the Bokar monastic community in Western Tibet, not far from Mount Kailash, which is one of the most important sacred places of Hinduism and Buddhism. 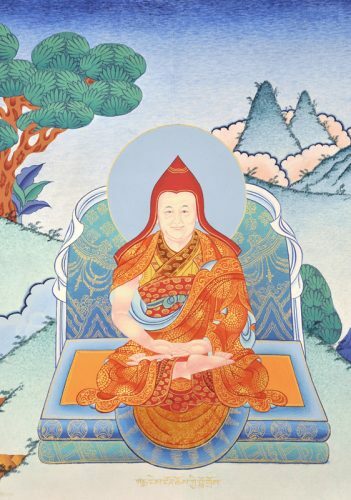 Then, at the age of twenty, he left Tibet and after many hardships he was able, with those who chose to follow him, to reach Mustang in Northern Nepal and then India, where he became a close disciple of Vajradhara Kalu Rinpoche. Under Vajradhara Kalu Rinpoche’s guidance, Kyabje Bokar Rinpoche completed the traditional three-year retreat twice in Sonada, the Indian monastery of Kalu Rinpoche located not far from Darjeeling. During his first retreat, he studied and trained on the practices of the six yogas of Niguma of the Shangpa Kagyü; his second retreat was based on the practices of the six yogas of Naropa of the Karma Kagyü. Kyabje Bokar Rinpoche was considered to be Vajradhara Kalu Rinpoche’s spiritual successor. He benevolently taught the Dharma to the monasteries around Darjeeling as well as Sikkim. Having meditated in strict retreat for over 19 years, Kyabje Bokar Rinpoche was one of the main meditation teachers of the Kagyü. His remarkable qualities caused him to be chosen by Kalu Rinpoche to direct the retreat centers in Sonada, and His Holiness the 16th Karmapa chose him to take charge of the retreat center of Rumtek (the new seat of the Karmapas in Sikkim, an Indian territory between Nepal and Bhutan), a position which he upheld for more than 13 years with utmost integrity, dignity and a deep sense of responsibility. In 1986, Bokar Rinpoche founded a monastery named Bokar Ngedon Chokhor Ling at Mirik, a village in the hills of Darjeeling, where the 11th century Mahasiddha Maitripa, one of Marpa’s teachers, had done a retreat. Later Bokar Rinpoche established retreat centers near this monastery for the practice of the Kalachakra, the six yogas of Naropa of the Karma Kagyü and the six yogas of Niguma of the Shangpa Kagyü. for exiled Tibetans, by directing studies and practice in his monastery in Mirik and by helping, as much as possible, the monasteries of Sonada and Rumtek. for the Tibetans in Tibet, by reconstructing his monastery in Bokar, ordaining monks, and starting a retreat center there. for Westerners, by conducting each winter a seminar of apprenticeship for meditation especially designed for them. 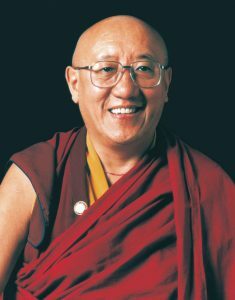 Bokar Rinpoche suddenly passed into parinirvana on Tuesday, 17th August 2004. During the ceremonies held for the funeral were present: His Eminence Gyaltsap Rinpoche and monks from his monastery, monks from His Holiness Karmapa’s seat at Rumtek, His Eminence Jamgön Kongtrül Rinpoche, and Yangsi Kalu Rinpoche, as well as Drupön Rinpoche who had accompanied Karmapa out of Tibet, and many other lamas. Numerous students from all over the world made the journey. We received the communication from Lama Chodrak, organizer of the Kagyü Monlam in Bodhgaya, that H.H. The Gyawlang Karmapa will associate to the homage he wishes to offer to Vajradhara Kalu Rinpoche at the occasion of the 32nd Kagyu Monlam 2014, an homage to Vajradhara Bokar Rinpoche. He will also announce Vajradhara Bokar Rinpoche’s rebirth. This news has been confirmed by Chak Ngodup Tsering Burkhar, assistant of Khempo Lodrö Dönyö Rinpoche.